This is a question I found myself asking. I work hard. I spend a lot of my days at a computer, on my grind. Weeks, months, years pass by in this mode of existence featured very prominently in my day to day. I’m married and my wife works hard, too. We’ve been working to get our financial lives in order. We budget, cook food at home, and generally reap the financial benefits of being homebodies. We’ll travel later, right? This is a personal and philosophical question. Somewhat out of the blue, my wife and I decided: No! Now! We fired up TravelExcellence.com and before you knew it, we had booked tickets for 8 days in Costa Rica. This is very out of character for us. In our nearly 4 years of marriage, we have been king and queen of the staycation. What caused us to change our minds? You Will Expand Your Horizons. There’s something about getting out there and doing things that makes you bigger on the inside than you were before. When we finally made the trip, we found ourselves meeting all kinds of interesting people. We met Thomas and Sema, the American expats and business-couple. We heard their ideas on life and gleaned important information about how they are able to fund their international “gypsy” lifestyle. Alone at home, we could have saved money and earned some more, sure, but we wouldn’t have mixed with adventurous people that we met in CR. You Remember What’s Important. Left to myself, in my little office, it’s easy to forget why I’m trying to become financially stable in the first place. Money buys options and possibilities. It’s a ticket to facets of life that would otherwise be out of your reach. It’s a hand up from the grind that leads some people through a 40 year career into a retirement that they’re too old and tired to enjoy. By taking some time away, especially if you have a significant other, you get time to simply enjoy life and enjoy each other. It puts things back in perspective. You Do Better Work Once You Get Back. This piggy-backs off the previous point, but I do think it is distinct. When we got back from our trip, it was so much easier to do the work I have to do every day. I had a renewed energy, new ideas, and a friendlier manner with the people I interact with in my work. When you work all the time, there is some part of your mind that is always churning away on the hamster wheel. If you never give that little fellow a breather, you diminish your own productivity. Just because you’re not burning out yet doesn’t mean you don’t need a break. You’ll get more out of your time if you do. I think world business culture is moving toward to recognition of time taken away from work. Whatever the case, I am going to continue my working life with a willingness to invest in vacation for me and my wife from our daily toil. Like I said, the benefits are sometimes intangible, but I think there are plenty of recognizable benefits that you can see with your eyes (and in your bank account). 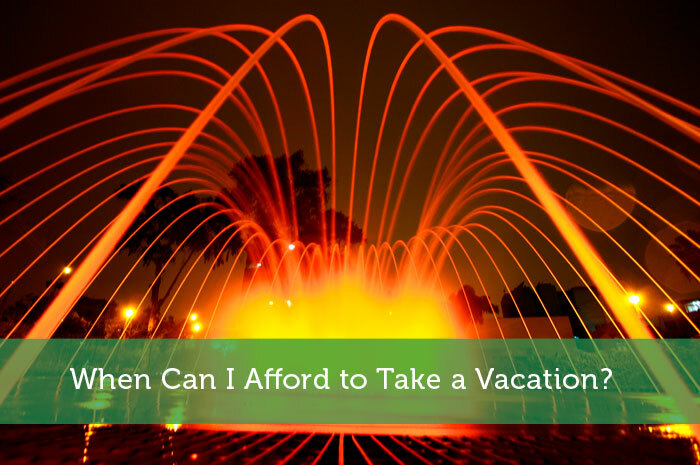 When Can I Afford to Take a Vacation? I hope you post pictures of Costa Rica! I just don’t see the point of working without resting. Europeans totally get this, Americans still have to work on this. We have a great work ethic but forget that we have to recharge our batteries. I love travel through out my state though! Glad you found some balance between your life now and “later”. I think it’s important to have a good life now, just as long as you’re not sabotaging your future. It doesn’t seem like you’re doing that though! Glad to hear you were more productive when you got back, usually after a trip I’d be useless for a week! Great read!! Good for you for taking some time off to enjoy life!! Right now, I’m currently debating if my husband and I (and our two little ones) should take a cross country trip across the US for a month or so. It would be expensive – but geez, talk about living!! I’m struggling with that now. In prior years we stayed home because 1) we lived on a large piece of land with lots of maintenance required, and 2) we were putting nearly every last cent toward retirement, son’s college and paying off our mortgage. Now that we accomplished those priorities, we do have money available to travel. My husband definitely is more interested in me and he is the one who always points out that we need to travel while we are still young enough to do it. There will be plenty of time to stay home again when we are older. But quite frankly, if we can’t drive to our vacation spot, I don’t want to go. I am crazy afraid of flying which after 37 years of marriage, I don’t think my husband yet realizes. While I’m not agoraphobic, I do feel home is my favorite place to be and quite honestly, don’t feel I need to expand my horizons. I agree with you! One day especially when we are old enough and couldn’t get to travel somewhere, it must feel great to have already traveled in different places. The experience must be priceless! So, if there is still a chance, go somewhere and have fun! Get a lot of pictures! Make it memorable! All about finding the right balance. That’s why they call it Personal finance you have to make the decision that work best for your situation. Enjoy the trip! I’ve put off several trips this year because I kept telling myself I must save. But then I realized I’m putting off living while I’ve already made so many changes to save more. Correcting that mistake at the end of the month with a trip to a costuming festival which a dear friend has been telling me to come to for years. Life is short indeed, and Ryanair flights really are cheap if you pack everything in carry-on. We save for vacations on a regular basis. There’s a vacation fund that we put money into each month. We also do a bit of credit card churning to pay for flights and hotels. All in all we find that we’re able to take at least one 2 week vacation abroad each year. Next will be Turkey! Recharging yourself is so essential! There’s only so much of the daily grind I can take before I know I need to take a break. Sounds like you had a great time in Costa Rica.